Paint BidTracker Capital Spending maps are an invaluable tool for coatings manufacturers, suppliers and contractors looking to grow their business. These beautifully designed, laminated wall maps highlight key projects for the year and provide a detailed visualization of approved spending by state and YOY analysis. 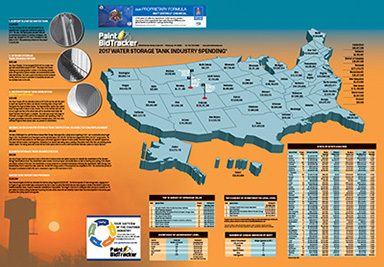 A must for conference rooms, meeting rooms and business development teams, the 2017 Capital Spending Water Storage Tank Wall Map is available now for only $50. Or you can order all three maps in the Capital Spending series — Water Storage Tank, Water & Wastewater, Bridge & Highway — at the discounted price of $100! Get this special offer here.